In ancient times, before Riga had been built, a very large man named Kristaps (the Latvian form of Christopher) built himself a hut on the right bank of the Daugava River. He earned his living by carrying people across the river on his back (or in some versions, in his ferry boat). They disembarked at the spot where Riga now stands. With his last ounce of strength, Kristaps laid the child on the rug in front of the hearth in his hut and dropped off into an exhausted slumber. In the morning Kristaps awoke to discover that the child had disappeared, leaving behind a coffer filled with gold. Kristaps was a humble man and from this treasure, he spent not a centime (in Latvian coinage, santims is 1/100th of a lats) until his dying day. Then he gave all the money to build Riga near the spot where his hut once stood. In church legends, St. Kristofor (Kristaps/Christopher) was a giant from Canaan who lived in the 3rd century AD. He spread the Christian message of love and died a martyr’s death. In Greek, Christophoros means “one who carries Christ.” In 15th-century Riga, St. Kristaps became the beloved patron saint of sailors and others employed in the merchant trade [probably a parallel with the St. Christopher’s medal worn by travelers everywhere even today]. The common folk of Riga transformed the foreign St. Kristofor into their own mythic figure and prefer to claim that he founded the city rather than the powerful German bishop Albert (mentioned in my April 29 posting about the spires of Riga. 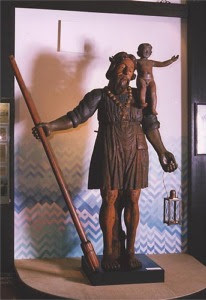 Around 1590, a replica of Lielais Kristaps (Big Christopher) was carved from a 2.36-meter pine log (i.e. nearly 8 feet) and placed on the bank of the Daugava River. This cherished statue even survived the ravages of the Reformation, when many Catholic artifacts were destroyed. Regardless of their religion, people visited the statue, decorated it with ribbons and floral wreaths, lit candles, and begged Kristaps to protect them from evil. Today the statue of Kristaps is kept in the Museum of Riga’s History and Navigation (around the corner from the Dome cathedral). In recent years a replicate in a glass case has been placed near the river on 11 Novembra Krastmala. Lielais Kristaps also appears on the reverse side of the 10-lati coin (worth approximately $5). Don’t be surprised if you see in various places during our stay in Riga likenesses of the giant with a baby on his left shoulder, a lantern in his left hand, and an oar in his right. May he also look after us.